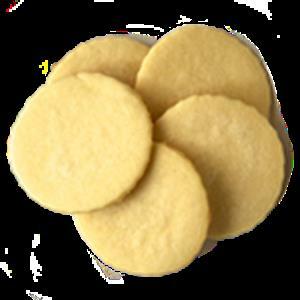 Description: KetoVie Café Butter Almond Cookie Dough has a 3.7:1 ketogenic ratio and makes the creation of roll and bake recipes easy. For more recipes, see ketovie.com. KetoVie Café Butter Almond Cookie Dough is for desserts, snacks or dessert bases for individuals following the spectrum of ketogenic diets. Each container contains 24 pre-portioned delicious, high in fat, low in net carb, cookie dough balls. KetoVie is designed for individuals over one year of age and indicated for the dietary management of intractable epilepsy and other conditions managed by a ketogenic diet. Preparation: Thaw and knead dough to prepare for use in Butter Almond Cookies below or other recipes available on ketovie.com. Do not eat raw dough. Follow recipe directions for baking at proper temperatures and for specified times. Preheat oven to 350 degrees F. Knead dough ball and divide evenly into 2 smaller balls. Roll each ball between your hands until smooth. Press between two sheets of parchment paper using a tortilla press or roll thin with a rolling pin. Gently lift flattened dough and place on ungreased baking sheet. Bake 8-10 minutes or until edges start to brown. Makes 2 cookies. Enjoy as is or sandwich (2 cookies) with rich, creamy filling or roll out each dough ball and use cookie cutters for desired shapes. Storage: If storing product refrigerated, consume within 3 days of receipt. For extended shelf life, freeze upon receipt for up to one year. Once thawed, consume within 3 days. Recommend freezing container and using the pre-portioned servings as needed. Ingredients: Almond flour, palm fruit shortening, coconut flour, medium chain triglycerides (gum arabic), eggs (citric acid), butter (cream, natural flavorings), vanilla syrup (water, natural and artificial flavor, cellulose gum, sucralose, sodium benzoate [preservative], citric acid, carmel color), water, konjac glucomannan, almond extract, baking powder (sodium bicarbonate, cornstarch, sodium aluminum sulfate, calcium sulfate, monocalcium phosphate), xanthan gum, salt, baking soda (sodium bicarbonate). Contains milk, nuts and eggs.